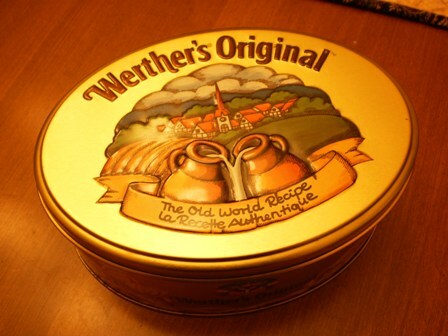 Quilt, Knit, Run, Sew: Ask me what's in my Werther's Can? This summer, my sister gave me some metal tins that she didn't have use for any more. I really like this oval one and I love Werthers candies. But there are no candies in this can. See, I invited my niece Michelle and her hubby Scott came over for supper. I had an ulterior motive. While they were here visiting, we put everyone to work. 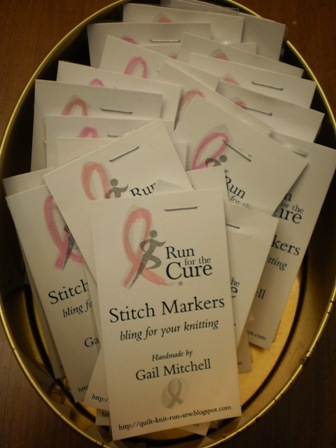 Scott re-programmed our remote control for our TV and then we all assembled my Run for the Cure stitch markers. Scott designed a nice little business card size package for my stitch markers which are stapled on the back of the card. So, here's what they look like in the can. 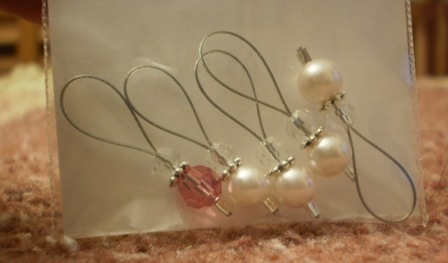 It's hard to read but under the words Stitch Markers, it says "bling for your knitting". So cute... So, until the end of the month, this can is going everywhere with me. I hope by the end of the month this can will be empty of stitch markers and replaced with $5.00 bills. 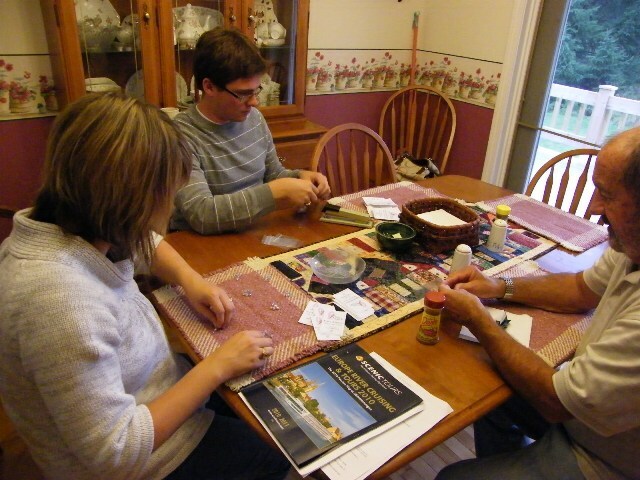 Thanks for your help today Michelle and Scott! Post note: Some have asked if I can mail these. I sure can. I can mail up to 5 sets in Canada for $1.25 and airmail to the US is $2.25. I'd love to have your support from afar. how many sets did you make? What fun... I am sad I wasn't there to help! DO they open? Or do you just slide them on your needle? I guess since I'm not a knitter I don't really understand how they work. In my mind they should go on the yarn not the needle??? Are they for sale? I'd like to support the cause, and I know some knitters. I would love to buy them too...email me! Hope you bring that can with you to KV..I plan on being there Thurs. aft...any chance???? Could you give Patience some? I would love to have some for my knitting! Just wondering how much they are...I'd like to buy a package for a knitter friend who really got me going....perhaps you could talk to mom about me getting them, etc..